While the donuts are still warm coat them in cinnamon-sugar. I've never made English muffins before, so I did some research and found this method. They look amazing - and easy! I am going to give them a try, while converting the recipe to gluten-free. This cornbread is so delicious, no one will know it is gluten free. I love the extra "toothy-ness" of coarse ground cornmeal - it adds a nice texture and heartiness. Combine softened butter and sugar in large bowl. Beat at medium speed, scraping bowl often, until creamy. Add eggs; mix well. Stir in sour cream and milk. Reduce speed to low; add all remaining ingredients. Beat just until mixed. Pour batter into greased 8-inch square baking pan. Bake for 18 to 22 minutes or until golden brown and toothpick inserted in center comes out clean. Serve warm. Pre-heat oven to 375F. Grease 1 1/2 quart round casserole. Cut bacon slices into thirds and cook in a frying pan over medium heat, stirring occasionally. Add onion and continue frying until bacon is cooked through. Spread in bottom of prepared casserole dish. Beat eggs, milk, salt, pepper and Bisquick with hand mixer until almost smooth. Slowly pour over bacon in casserole dish; sprinkle with cheese. Bake until knife inserted in center comes out clean - about 35 minutes. This recipe is a family favorite and it comes from my dad's cousin, Christie. It is a spin off of the traditional blintz recipe. It may be served warm for breakfast with your favorite fruit jelly or jam, and sour cream if desired; we always had it with my mom's homemade currant jelly. Cold leftovers are good, too! Blintzes (also called blini) are cousins to French crêpes, but originate instead from eastern Europe. They are tender, ultrathin pancakes rolled to enclose a sweet or savory filling such as cottage or ricotta cheese, fruit, or meat mixtures. Traditional blintzes are then sautéed until golden brown and served with sour cream. This recipe saves time and labor by utilizing a simple layering technique -- similar to "crustless quiche" or "tamale pie" -- and the result is a cake-like dish that is cut into squares. It is really simple and delicious. Pre-heat oven to 350F degrees. Grease a 9" square or rectangular baking pan. Make the batter: Combine flour, baking powder and salt; set aside. Cream butter and sugar; add eggs. Stir dry ingredients into mixture alternating with milk. Make the filling: Combine cottage cheese, egg, sugar, and butter. Stir until mixed completely. Pour half of the batter into the prepared baking pan. Add all of the filling mixture evenly on top of the batter layer. Top with second half of batter. Bake 1 hour. Remove from oven and allow to cool slightly. Cut into 3" squares. Serve with sour cream and strawberry jam, or your favorite topping. Recipe courtesy of Christie Leighton. This recipe is a family favorite; it was published in the Mayflower Church cookbook in 1983 and we've been enjoying this delicious breakfast dish ever since. It consists of a single, pie-sized pancake which puffs up during baking - similar to a Dutch pancake you might order at Pannekoeken or The Original Pancake House. Grease a glass pie plate and set aside. Beat eggs with a fork. Add remaining ingredients; beat until smooth. Pour into prepared pie plate and bake for 10-20 minutes or until golden and puffy. Note: when you remove the pancake from the oven it will fall. Serve with your favorite toppings such as maple syrup, sliced fruit, or powdered sugar and lemon juice. This is an easy recipe to make in the summer when fresh, local zucchini is plentiful. In a large bowl, beat eggs, oil, sugar and vanilla together. In a seperate bowl, combine the remaining dry ingredients. Stir the dry ingredients into the wet and fold in the zucchini. Pour batter into two greased 9 inch loaf pans. Bake 45-60 minutes or until done. Calories 260, Calories from Fat 140, Total Fat 15g, Saturated Fat 1.5g, Cholesterol 25mg, Sodium 110mg, Total Carbohydrate 30g, Dietary Fiber 2g, Sugars 17g and Protein 4g. From Bob's Red Mill - whole grain foods for every meal of the day. You may substitute low-fat sour cream for the regular sour cream. Also, feel free to use nutmeg instead of the mace, or use a spice mixture like I do (for example, Penzey's Apple Pie Spices). Heat oven to 350F degrees. Grease a loaf pan and set aside. Cream softened butter with sugars, mixing on slow speed until well blended. Add sour cream. Stir beaten eggs into creamed mixture. Add orange rind (if using). Add dry ingredients to the creamed mixture alternately with the mashed bananas. Fold in nuts. Pour into prepared pan and bake 50-60 minutes, or until knife inserted in center comes out clean. When cool, wrap loaf in foil. This bread is even better the day after it is made. This is great for a leisurely weekend breakfast. I made them this morning and they were delicious! Heat waffle iron. Also, preheat oven to 200ºF if you want to hold the waffles warm after you have made them. In another bowl, whisk together eggs, milk and butter. Spoon ½ cup batter (or the amount recommended by your waffle iron’s manufacturer) onto the hot iron. Spread the batter using the back of a wooden spoon. Close the lid and bake until waffle is golden brown (typically 3-5 minutes, or until steam has lessened). Hold waffles on a rack in 200ºF oven while you finish baking the rest of the waffles. 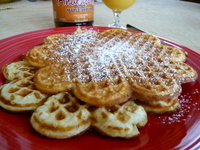 Serve immediately with pure maple syrup, such as Anderson’s, powdered sugar and butter. Note: The following ingredients may be folded into the batter if desired. These are delicious. Do not use a pan larger than 13" x 9" x 2" or your buns will not be very tall. Dissolve yeast in warm water with a pinch of sugar; let stand a few minutes. (Make sure it foams or else your yeast may be dead.) Stir in milk, sugar, salt, egg, shortening, and half of the flour. Beat until smooth. Mix in enough of the remaining flour to make the dough easy to handle. Punch down dough (deflate air). 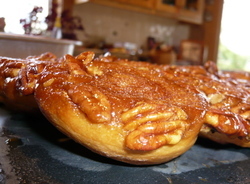 Melt ¼ butter in baking pan (13”x9”x2”); stir in ½ cup brown sugar (packed), 2 Tbsp corn syrup and pecans. Spread evenly across bottom of pan. Roll dough into rectangle, 15”x9”; spread with softened butter. Mix sugar and cinnamon; sprinkle over rectangle. Roll up along one long edge. Pinch seam to seal well. Stretch roll to make even. Cut roll into 15 slices of equal size. Place in baking pan (five across, three down), spaced evenly. Cover and let rise until doubled, about 30 minutes. Bake 25-30 minutes, and then immediately turn pan upside down on a large tray. Let pan remain a minute so caramel drizzles over rolls. Soften the yeast in part of the water in a small bowl. Combine butter, sugar, salt, and dry milk in mixer bowl. Mix until well combined (but do not whip until light). Add eggs gradually to butter mixture. Add water and mix briefly. Add flour and softened yeast. Mix to a smooth dough. Knead the dough in the mixer using a dough hook for 4 minutes at medium speed. Place dough in a lightly oiled bowl or pan; place in a warm place (preferrably 80ºF) and allow to rise for 1 ½ hours. Bring dough to work surface. Cut dough into 3 equal pieces, and roll into loose loaves (do not punch out the air). Place on heavily floured sheet pan, cover with plastic wrap, and refrigerate until ready to use. See separate recipe for Donut Glaze. Combine all ingredients in a mixer bowl. Using the dough hook, knead the dough at medium speed until it is completely developed, about 6-8 minutes. Allow to rise in a warm place (about 80ºF) about 1 ½ hours or until doubled in bulk. Roll out 1/2" to 3/4" thick and cut into donut shapes (rings, bismarcks, long johns, twists etc.). Heat lard to 375ºF in a large pot. Fry donuts in hot lard, a few at a time. Use wooden chopsticks to check for bottom color to be golden brown, and then flip over to other side. Remove immediately when golden brown on both sides. When donuts are done, lift them out and let excess fat drip off. Place in a single layer on absorbent paper to cool slightly. Glaze donuts while they are still warm, and then allow to cool completely. Soften gelatin in the water. Heat the water until gelatin dissolves. Dip donuts into warm glaze; re-warm glaze as necessary. Heat a non-stick omelet pan over moderately high heat and add the clarified butter or oil. Whisk the eggs together in a small bowl. Season with salt and pepper if desired. Pour the eggs into the pan and stir until they begin to set, approximately 10 seconds. Pull cooked egg from the sides of the pan toward the center, allowing raw egg to run underneath. Continue doing so for 20 to 30 seconds. When cooked as desired, flip one-third of the omelet toward the center with a spatula. Roll the omelet onto the serving plate so that it lands with the seam underneath. Notes: An omelet may be filled with a variety of ingredients such as sauteed mushrooms, cheese, meat, vegetables, herbs, etc. Whisk together the eggs, egg yolks, water and milk. Add the sugar, salt and flour; whisk together. Stir in the melted butter. Cover and set aside to rest for at least 1 hour before cooking. Heat a small non-stick saute pan (or crepe pan); brush lightly with clarified butter or drop a few droplets of oil into pan - that is all you should need. Pour 1-1 1/2 oz. batter into pan and swirl to coat bottom of pan evenly. Cook until set and light brown, approximately 30 seconds. Flip it over and cook a few seconds longer. Remove from pan and hold on a plate. Continue with remaining crepe batter. Layer parchment paper between cooked crepes to prevent them from sticking together. Cooked crepes may be used immediately or held briefly in a warm oven, or wrapped in plastic wrap and refrigerated for 2-3 days or frozen for several weeks. Rub the chicken breast with the garlic, cumin, salt and pepper. Grill or broil until done. Allow to rest briefly, and then cut into strips. In a well-seasoned 9-inch saute pan, saute the mushrooms in the butter until tender. Add the jalapeno; saute for 30 seconds. Add the chicken, bell pepper, green onions and cilantro and saute until hot. Add the eggs and season with salt and pepper. Cook the mixture, stirring and lifting the eggs to help them cook evenly, until they begin to set. Sprinkle the cheese over the eggs and place under the broiler to melt the cheese and finish cooking the eggs. Slide the finished frittata onto a plate or cut into wedges for smaller portions. Note: See separate recipe for pie dough. Place diced, cooked bacon and grated cheese in pie shell. Bake at 350 degrees for one hour, or until the custard is just set (when you gently shake the quiche, only the very center will jiggle). Remove from oven. Remove from the heat and stir in the tabasco sauce and 6 ounces cheese. Whisk the egg yolks together, then stir into the grits mixture. Whip the egg whites to soft peaks, add the sugar and whip to stiff peaks. Fold the egg whites into the grits mixture. Pour the soufflé into a well-buttered 2-quart casserole or soufflé dish. Top with the remaining 2 ounces cheese. Bake in a 350-degree oven until set and browned, approximately 30 minutes. Serve immediately. Brush the interior of a 6-fluid-ounce ramekin with melted butter. Place ham in bottom of ramekin. Break the eggs into a cup and pour them carefully into the ramekin on top of the ham. Season with salt and pepper. Bake in a 325 degree oven until the eggs begin to set, approximately 8 to 10 minutes. Remove from oven, and then add the cream and cheese. Return to the oven until eggs are cooked and cheese is melted. Serve immediately. Saute or griddle the ham or Canadian bacon slices until hot. Bring 1 quart water to a boil and add the salt and vinegar. Add the eggs and poach until done. Place the muffins on a plate and top with ham or Canadian bacon. Place the eggs on the ham/bacon and cover with Hollandaise. Garnish each egg with desired garnish and serve immediately. This recipe is similar to the one we had at the Windom Park Bed & Breakfast. Peel pears and cut into slices or 1/2" chunks. Melt butter in a 9- or 10-inch, non-stick, oven-proof pan. Add pears to pan and saute until lightly browned. In a separate bowl, blend together eggs, milk, flour, granulated sugar, vanilla and salt. Pour egg mixture over pears in pan. Bake in 425 degree oven for 8-12 minutes. Remove from oven cut into individual servings. Spoon cream cheese over each portion and sprinkle with brown sugar. Recipe courtesy of Devils Tower Lodge, Devils Tower, WY.